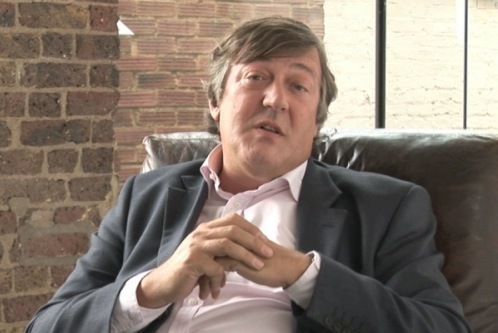 Stephen Fry records his voice for Wikipedia | the Wikimedia UK blog! Stephen Fry wears many hats – wit, television presenter, actor, writer and geek. He now has a new hat to wear: Wikipedia contributor. Stephen was recently approached by Wikipedia editor Andy Mabbett (User:Pigsonthewing), who founded the Wikipedia voice intro project (WikiVIP). Although in New York at the time, Stephen willingly obliged and recorded a sample of his speaking voice for use on his Wikipedia biography. The project asks people who are the subject of Wikipedia articles – whether they are celebrities like Stephen Fry, or those notable for other activities like scientists or artists – to make short recordings of their voice, lasting around ten seconds or so. The recordings are then uploaded to the article so that Wikipedia’s readers know what they sound like and how to correctly pronounce their names. Contributors to the project so far include lunar astronaut Charlie Duke and Baron Knight of Weymouth a peer of the United Kingdom. You can listen to all of the voice recordings made for the project so far here on Wikimedia Commons or on the appropriate Wikipedia articles. Once the recording of Stephen’s voice was uploaded and added to his biography, Andy also transcribed it as timed text captions which are displayed as the audio plays. Andy is also working with the BBC on a project to extract similar clips from certain BBC programmes. Significantly, this is the first time that the BBC have openly licensed content from their broadcast programmes. to articles so far range from Sir Tim Berners-Lee to Aung San Suu Kyi. You can help the Wikipedia voice intro project by asking people you know who are the subject of Wikipedia articles to make recordings of their voices in any language in which they’re comfortable (the project is not just for English speakers). You can also help to transcribe the existing files into timed text captions.